The impending Warriors-Rockets series is the matchup hoops fans wanted. It’ll feature the NBA’s two best teams and America’s best basketball city: Oakland. When it comes to cities with deep basketball roots, from pro arenas to the playgrounds, most people think of New York, Chicago, Boston, and Los Angeles. And with good reason. But if we’re judging solely by history and merit, each of those hotbeds of hoops must step aside for what is truly America’s best basketball city: Oakland. Yes, Oakland. Long before Oakland’s Warriors staked their claim as the NBA’s greatest team ever, the East Bay was churning out hardwood stars like the assembly lines at an old East Oakland factory. The city’s storied basketball lore goes back to at least the 1940s, when Oakland native Don Barksdale starred for Oakland minor-league teams before becoming an American sports pioneer. Barksdale became the first Black player to appear in an NBA All-Star game, as a member of the Baltimore Bullets in 1953. He was followed by Bill Russell, a star at McClymonds High in Oakland, who won two NCAA titles with USF in the mid ’50s. Russell went on to win 11 NBA titles in 13 seasons for the Boston Celtics and became the league’s first Black head coach. Russell is so synonymous with NBA glory the league has named its Finals Most Valuable Player award after him. Barksdale and Russell paved the way for succeeding waves of East Bay talent, feeding the NBA for decades with future stars such as: Paul Silas, Brian Shaw, Gary Payton, J.R. Rider, Greg Foster, Antonio Davis, Jason Kidd, Leon Powe, and Damian Lillard. Several other past NBA players — including Paul Pierce and Cliff Robinson — were born in Oakland but grew up elsewhere. And don’t sleep on El Cerrito’s Drew Gooden, Berkeley’s Phil Chenier, and Danville’s Mark Madsen. 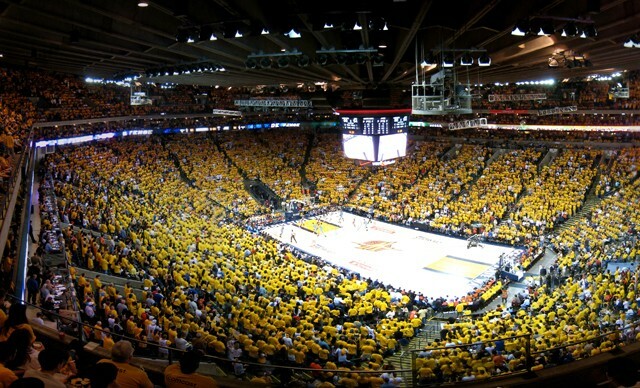 That the world’s best team plays in the heart of East Oakland is no anomaly but, rather, the logical culmination of this city’s insanely rich basketball history. Lastly, my thoughts and best wishes go out to A’s outfielder Stephen Piscotty and his family over the passing of his mother, Gretchen Piscotty. The A’s acquired Piscotty this past offseason, in part so he could live close to his mother’s Pleasanton home as she battled ALS — also known as Lou Gehrig’s disease. Piscotty grew up rooting for the A’s at the Oakland Coliseum, where local fans gave him a long ovation before his first at-bat Tuesday night — his first game after his mother’s death. Houston players and coaches showed a lot of class during the emotional moment; they applauded Piscotty as pitcher Lance McCullers Jr. stepped off the mound, allowing the grieving A’s player some time to acknowledge the Coliseum fans. Piscotty then knocked a single to right. I know lots of Oakland fans who view the Coliseum as their second home and consider the people they sit next to as family. After watching this emotional moment unfold Tuesday night, it was easy to see their point.